Is it just me, or is there some MAJOR chemistry between these two paintings by Cy Twombly (left) and Jean-Michel Basquiat (right)? The Basquiat painting in question, "Untitled, 1986," was just sold at Sotheby's Paris to the tune of $3 million dollars. Despite this success, all my colleagues could talk about was how incredibly un-Basquiat-like the work was. The single form, centralized mass, vibrant red, and lack of textual references all mark this piece as something different from your run-of-the-mill Basquiat canvas. Clearly, that didn't dissuade whichever buyer walked away with "Untitled" after Tuesday's sale -- but it certainly rankled many of my coworkers. I'll admit, when I looked at this painting for the first time, it didn't scream "BASQUIAT" to me, either. It did, however, scream "TWOMBLY." Several summers ago. I interned at the Philadelphia Museum of Art. Although I worked in the Photography Department, I spent most of my free time lurking around the Contemporary Art Wing, and an especially significant portion of time hanging out in the Cy Twombly room. The PMA has the entirety of Twombly's ten part series from 1977-1978, "Fifty Days at Illiam." The ten canvases are inspired by Alexander Pope's translation of Homer's Iliad, each summoning a different incident or moment from the epic poem. 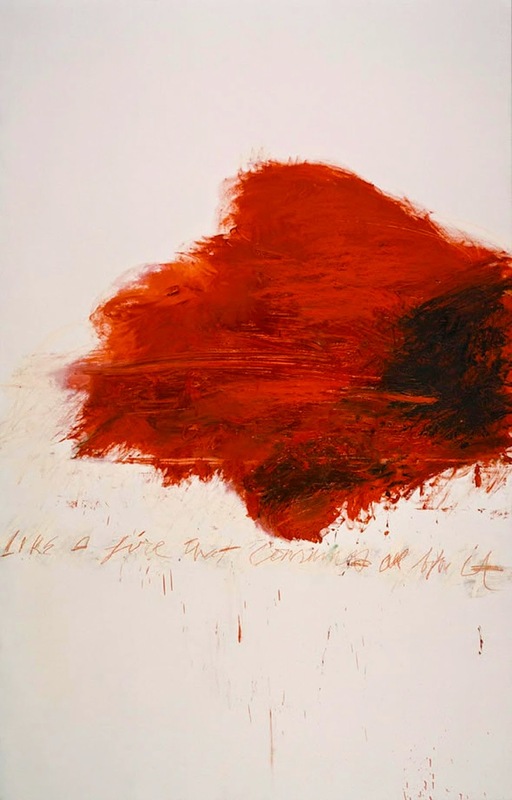 Twombly's characteristic combination of words and images is perfect for depicting the emotional and narrative turmoil of The Iliad, powerfully summoning the chaotic battles, astounding divine miracles, and heart-wrenching loss of Homer's tale. Does Twombly refer to the Greek army, stampeding across the battlefield, destroying all before them in the blind rage of war? Does he refer to the imminent destruction of Troy's impenetrable walls by fire? Does he refer to his own artistic force, tumbling and spreading across the canvas like a bloody stain? I'm not sure Twombly himself knew -- and I HIGHLY doubt Jean-Michel Basquiat had any idea. But his work summons the same blood-red fury, the same sense of looming foreboding -- as though his scarlet mask with it's unseeing, blindly staring eyes, might destroy all before it as well. The same dark shadow lurks at the edges of Basquiat's terrifying visage, promising the same threat of death, destruction, oblivion. Painted in 1986, there's no telling if Basquiat saw the Twombly work -- or ever read The Illiad. But the thought alone is enough to make me love the two artists even more.